This spacious one bedroom home is considered one of the finest rentals in Helen. Riverside Relaxation features: A spacious and relaxing upscale one bedroom - one bath condo style home with a large and beautiful two-sided gas fireplace (Liv. rm and bedrm). It is a clean, comfortable and spacious home right on the gentle Chattahoochee River with an in town location for the ease of enjoying Helen's many venues and year round activities. The condo has covered parking. It is like new and warmly furnished and decorated. The condo building has 4 units - 2 lower and 2 upper. This home is on the lower level. There is one easy flight of stairs to the condo or an elevator is available (occasionally unavailable-check with owner if it’s use is a necessity). Exterior hallway has video security. Read below for room-by-room info and a list of "Things to Do" in Helen. The front balcony (small/Juliet style), just off the dining room, provides a street view and a view of a few business establishments. Guests can also watch most parades, horse drawn carriage tours and mountain sunsets from this balcony. A gorgeous view of the river and backyard can be enjoyed from the covered rear deck, bedroom and living room. The backyard is level terrain with the Chattahoochee approximately 30 foot away from the condo. The river has a resident/guest access beach area for swimming or fishing. Peaceful and undeveloped Unicoi State Park is across the river. The living room has a comfortable leather sofa and recliner and two cushioned wooden chairs (extra chair in bedroom). It has a large, beautiful, very easy to use two sided gas log fireplace (seasonal- unavailable in summer) that can be viewed from the living room and the bedroom, a new (2017) 50" big screen TV, Dish with HD, DVD player, Wi-Fi and a MP3 player with hook up to Bose speakers. A view of the river can be seen from the living room. Living room door opens to the covered deck. The dining room has a table with seating for six, a coat closet, a side curio cabinet and a wine sidebar. Wine sidebar has empty cupboards for your own pantry food items. Double doors open to a small balcony off the dining room. Balcony view includes the passing by of collector cars, Helen's horse drawn carriage tours, seasonal parades and other events. The full kitchen features granite counter top, stainless steel appliances (side by side refrigerator, smooth top electric stove and oven, dishwasher, built in microwave), cloths washer/dryer, breakfast bar, drip coffee pot, blender, toaster, hand mixer, crock pot, plenty of cookware, dishes and silverware. Three bar stools at kitchen breakfast bar provide extra seating. The home has one bedroom. It is roomy with a comfortable king-size bed (new in 2017 pillowtop mattress). Bed linens, pillows and blankets are provided. The bedroom has a black out the light curtain on the street side to help you sleep. Bedroom also has ample closet and dresser storage for your personal belongings. You can settle right in just like home. A door from the bedroom opens onto the covered deck. A view of the river can be seen from the bedroom. The over-sized bathroom includes a jetted tub (big enough for two), a separate shower and a cabinet with plenty of towels, wash cloths, storage and counter space for personal items. Your home away from home has a relaxing covered rear deck overlooking the Chattahoochee River with an open and unobstructed river view. Across the river, the view is of a gradual hillside preceding an undeveloped area of beautiful Unicoi State Park. The rear deck has a table with four chairs and a new (fall 2016) gas grill. Enjoy a quiet morning with a hot beverage or have a private candle lite dinner for two at your very own riverside table. First of all, you can stay busy or you can just relax at the Riverside Relation condo. Just as its name implies, if you don't want to do anything but put your feet up, relax and simply watch the river water go by. The "in town" location of Riverside Relaxation allows for ease of walking to and enjoying the variety of activities Helen has to offer. You are within walking distance or very close proximity to the following: the event Festhalle, Christmas festivities, various parades (some viewed right from the condo's front balcony), wedding chapel, miniature golf, 4th of July fireworks, annual hot air balloon race (first week in June- ck. Helen visitor website for dates or contact me), summer tubing on the river, a waterpark (with a pool, waterslides and a lazy river), riverside picnic park, downtown's city park, Helen's Arts and Heritage Center (a small museum), Betty's Country Grocery Store (warmly unique with all the essentials), liquor stores, many interesting and engaging shops, numerous restaurants (from casual to upscale, traditional to German fare, some with outside seating, some on the river, several with evening live music), horse drawn carriage tours, the trail head to hike from Helen to Unicoi State Park and much more. A family style roller coaster is coming in summer 2019. Within a half mile to two miles from the condo you can experience Heritage Trail (shaded, level, paved sidewalk paralleling the Chattahoochee River), historic Nora Mill Granary and General Store (freshly milled whole grains and other merchandise), Habersham Winery, antiquing, the historic Old Sautee Store (rocking chair porch and interesting history, souvenirs and gifts), Hardman Farm and Indian Mound Historic Site (in Sautee), the educational Folk Pottery Museum (in Sautee), the lovely Lavender Shop (in Sautee), Fred's Famous Peanuts roadside store, Woody's Mountain Bike Rental (with trail location info), Innsbrook Golf Course (hilly and beautiful- open to the public), two miniature golfs, Cool River Zipline (some ziplines go over the Chattahoochee, have an awesome wall climbing, aerial walkways and more) , Chickamauga Creek covered bridge and Unicoi State Park. Within two to five miles: Anna Ruby Falls (trail is paved, gradual incline), Yonah Mountain Vineyard, several other local and well rated wineries, Cabbage Patch Kids Babyland, Smithgall Woods State Park and many, many other places of interest. If you are out driving the scenic countryside you might wish to enjoy two spectacular waterfall trails just 6-7 miles away (Dukes Creek Falls and Raven Cliff Falls - both off Hyw 348). Brasstown Bald, the highest point in Georgia, is approx. 40 minutes north of Helen. A number of beautiful vistas can be enjoyed at roadside pull offs and along hiking trails including those at Brasstown Bald. Southeast of Helen, two interesting shops (Mark of the Potter and Serendipity) are about 10 miles north of Clarksville on Hwy197. The surrounding area, GA Highways 129, 75 and 348 has a number of other spectacular sightseeing interests. These routes also provide access to a number of trails including the Appalachian Trail as well as ziplining, horseback riding, ATV and winter snowmobile adventures can be experienced at Sunburst Adventures in Clarksville. Indulge in your private candle lite jetted tub. In cooler months, snuggle in front of your radiant gas log fireplace in the bedroom and the living room. Unwind on the covered deck watching the river and summer tubers go by, the occasional ducks or people fishing. Riverside Relaxation and the charming Alpine town of Helen both offer so much including the feeling of home. Our place is a great place to stay for your north Georgia get away. Click "contact owner" if you have any questions. My husband, Tom, and I live in Englewood Florida which is on the gulf coast about an hour and 15 minutes south of Tampa. It's a small beach community that we have been proud to call home for close to 30 years. We enjoy camping, hiking and gardening- growing lots of herbs, fruits and vegetables. We enjoy Helen because it provides a variety of outdoor activities anytime of year. Tom and I have always liked vacation destinations where we could park the car when we arrived and then be able to walk to the places where we want to go. From this vacation home, Helen is one of those types of towns. Helen's charm is also inviting and unique. To us it feels comfortable, it feels like home and we love that we can just relax or seek things to do. We especially like the diverse mix of restaurants, the many venues we can walk to for live music, the colorful flowers planted throughout town, the tranquil views from the bridges that cross the river and the nearby hiking trails to connect with nature and work up an appetite. In the past when we would visit Helen we would rent a place on the Chattahoochee River, a place close to town, a place where we would watch the tubers pass by and entertain us with the challenges they encountered from unexpected river obstacles. We would sit and talk about how nice it would be to have a home of our own and how much various friend or family member would love it too. I think when you find something you like you want to share it with others and that is what set us out searching for a place we could enjoy and share with others. This particular home seemed to have it all. It was well maintained - in like new condition and beautifully decorated including a lovely fireplace. It was on the river with great views from the deck and located in town. To us having a place in Helen on the river was like a bucket list item. Something we always wanted and right there before us was this perfect, gorgeous home. And, we were not the first to realize how great this particular home was. It had a rental following so it already was being shared by others. Our friends and family could just add to the many who make fantastic memories here. So we purchased the condo and we are so happy that others are sharing this special place with us. toilet, shower, jetted tub, Spacious- plenty of towels/washcloths etc. in a side curio. Large clean bathroom with stand up shower and jetted tub. Cabinet for personal items. 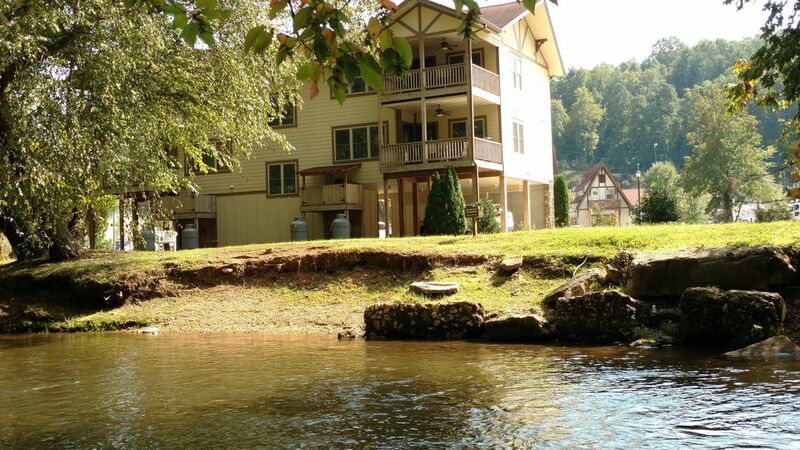 The home is located in town a short easy walk to many activities: Helen's Festhalle, tubing, shopping, restaurants, mini golf, music/nightlife and the trailhead for the Helen to Unicoi trail. The quaint village of Helen is unlike any place in the U.S. It is patterned after a Bavarian Alpine Village- from events, food and music to alpine structural designs and beautiful flower gardens. Helen is located in a river valley where protected State Parks rise on either side. Guests can enjoy their backyard scenic and unobstructed view of the gentle Chattahoochee River. Relax beside the river, wade in or take in the sights and sounds from your private covered deck. Located on the Chattahoochee River in downtown Helen. The river is just steps away where you can easily fish (license required), swim or simply watch the water and summer tubers go by. Central and gas fireplace (fireplace seasonal- unavailable in summer). Fireplace is also two sided- living room and bedroom. Private washer and dryer in condo. Towels and washcloths are provided. Free WiFi is provided, however, service in inclement weather can be intermittent in the mountains and valley of Helen. Check with owner for availability. Spacious and comfortable with seasonal gas fireplace, large flat screen TV, Dish Network with HD, DVD player, MP3 player and view of the river. Mr. Coffee. drip. 10 cup. Filters and coffee are not provided. Basic spices. Also, mixer and crock pot. Plenty of cookware, bakeware, dishes and silverware. Full kitchen. Guests describe it as very clean and well equipped. Seating for 6 plus 3 barstools at the breakfast bar. Dining room also opens to a small balcony and a nice town and mountain view. MP3 player with Bose speakers. Quality doesn't have to be loud:) Please be respectful to neighbors. DVD player and various movies are provided for viewing in the condo. An assortment of non fiction (educational and/or interesting topics related to the area) books are available for guest reading. Cards and a few board games for use. A variety of movies, (60 DVD's), are available for guest use in the condo. Level shaded backyard on the Chattahoochee River. Bring your lawn chair if you would like. Small balcony street side provides a peaceful town and mountain view. Rentals in Unicoi State Park located 2-3 miles away. Tubes to float the Chattahoochee river are available in summer months just a block away - or bring your own. The river is in your backyard! Rear covered deck with table and 4 chairs overlooking the Chattahoochee River and a wooded hillside view beyond the river. The beautiful and popular Innsbrook Golf Course is just a couple miles from the condo. Open to the public. Condo building has an elevator - check with owner (Patty) if it is necessary for you to use it during your visit. Condo does not have a handicap shower or other provisions for special needs. Pool is at a nearby (within walking distance) small waterpark - which also has waterslides and a lazy river. Further room by room details are described on this website under condo description. We have stayed in this condo numerous times and always enjoy it. It is always clean and the location is PERFECT! Patty is awesome to work with and VERY responsive to any questions that I have. We will be back! Was just there with my girlfriend for the weekend and we will definitely stay here again. The location was perfect and the unit was updated and clean. Highly recommended! Convenient to all the attractions in the area. However, If you are elderly or have bad knees and can't climb stairs, then this place is not for you. Elevator never functioned during our stay. Yes, this condo certainly is a convenient and nice place to stay. Thanks for saying so. The elevator does go out of service on occasion. Fortunately our unit is on the first floor. Elevator repair companies come up from Atlanta and what will further delay a repair is if a high rise chain motel has a problem. You can guess who will likely get service first. To keep my guests fully informed, beginning last July, I noted on this VRBO website (in two places) to please contact me if the elevator is a necessity. I also state the same language on all guest access information. I make a sincere effort so that it does not come as a surprise to anyone in need. In lieu of your comment the website now notes the info in three places. Thank you. Btw, the elevator was serviced the Tuesday after you left. We enjoyed our stay. The unit was very clean and nicely decorated. It is located in a very nice and convenient spot. We enjoyed Helen and surrounding area. Dahlonega was a nice day visit. You make a good point, Helen is a terrific base for visiting a number of interesting places. When returning at the end of day you are treated to a clean and comfortable condo, fixing dinner at home and relaxing riverside (even a summer cool swim in the river) or a wide choice of restaurants and music venues you can simply walk to. Thank you Darryl as well. Thanks for returning as a guest and for posting a generous five star review. I appreciate it on many levels. Come back whenever you can. If you are visiting Helen you need to stay here!! This place is clean and welcoming. We slept so well in her huge comfortable bed. The condo was well equipped, we had a designated carport slot and a wonderful view of the river. It's within walking distance of the town so we didn't have to worry about finding a parking place. We enjoyed morning coffee on the deck with the peacful sound of the river. The town had so many options for food. The ones we picked had delicious food and friendly servers. Thank you Patty for offering such a nice place to traveling people like us. We would definitely stay at your place again and have told our friends to stay at your condo if they visit Helen. Thank you for such an awesome review. When you find something you like we all lean towards wanting to share it. It is one of the reasons we share this condo - it is what makes you suggest it to your friends. Appreciate you sharing your kind words with the viewing public. Helen exults a number of activities to enjoy year round. There really is something for everyone. The Fasching festival in February (a carnival atmosphere similar to Mardi Gras). Includes a mid day Schnapps Stops street parade and river tubing. Also, Festhalle festivities. A trout tournament in March kicks off trout season. Bierfest (beer fest) in April. A Bavarian festival in May. A hot air balloon race, tethered hot air balloon rides and other festivities first weekend in June. The local peach season is June and July. There are numerous summer water and land activities- tubing, waterslides, parade, hiking, zip lines, go carts, mini golf, bingo, etc. A Taste of Helen is in August. Oktoberfest festivities and fall colors begin mid September along with local apple and pecan season. Fall also includes the Folk Pottery Show in Sautee and CrushFest (crushing grapes); a celebration at Yonah Mountain Vineyard. Winter hunting at nearby Smithgall Woods State Park (check their website for details). The Festival of Trees is celebrated from mid November to mid December. Late November begins the Christmas season with the awe filled Annual Lighting of the Village. The Christmas parade and Christkindlmarkt (a local and imported Christmas market/food/music event) is in early December. New Years Eve is celebrated with live music and the annual Dropping of the Edelweiss at Helen's Festhalle. Check Helen's Chamber of Commerce, tourism and visitor websites for specific dates and details for these and many other events. Helen also has an intriguing local history linking the present to early Cherokee settlers, gold miners and its lumber industry. More information can be found at Helen's nearby library and museum. Simply walking the village/town of Helen is a treat to the senses. You can enjoy the unique Alpine décor and cobblestone streets, bridges cross the Chattahoochee River in several locations providing peaceful views, flowers adorn parks and street side establishments, numerous park benches are scattered throughout the village just to sit and relax and delicious smells waffle from the many restaurants. Helen also has a welcome center providing visitor information and answers to area questions.